The oil complex is experiencing moderate losses this morning after a week of steady gains. Across the board, markets were able to reverse their losses yesterday morning and trend higher, rising enthusiasm following Wednesday’s bullish inventory report. This morning, crude prices are currently trading at $57.99, a loss of 37 cents (0.6%). Refined products tracked crude’s gains, with diesel gaining half a cent cents and gasoline rising about a penny. 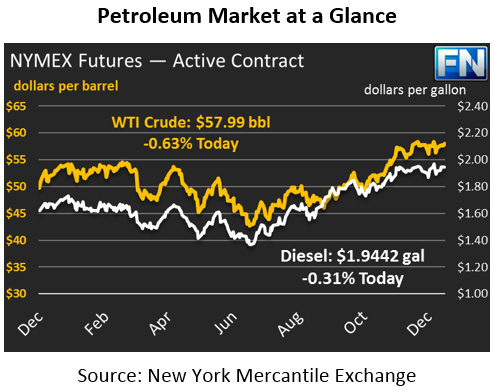 Today, both products are following crude prices lower. Diesel prices are down 0.6 cents (0.3%), trading at $1.9442. Gasoline, which has seen huge gains this week, is down 0.5 cents (0.3%), trading at $1.7428. Ineos, the operator of the the Forties pipeline in the U.K. that broke down, announced yesterday that the pipeline would be fixed by Christmas, and would be up and running by the end of the year. The announcement should have been a nice Christmas gift for consumers, but interestingly prices still rose yesterday. Markets never had a strong reaction to the Forties pipeline outage, so the return of supply has had little effect on prices. In international news, OPEC has remained fairly quiet since passing the deal extension through the end of 2018. OPEC typically talks up the market leading up to a major announcement, then lets the market runs its course for a while. The same has been true this go-round. There are glimpses into the inner-struggles of the organization. This week, Saudi Arabia announced it was too early to discuss ending the cuts early. Yesterday, however, the Russian Energy Minister stated there is a “common understanding” among OPEC members regarding the exit strategy. Now markets are speculating whether Russia will try to cut the deal short when it comes back up for review in June.